40ml Double cream plus 250ml to finish. 1 small pot natural Greek yogurt.  Place the milk. Cream and vanilla in a saucepan and bring to a simmer.  Meanwhile beat together the egg yolks, corn flour and caster sugar in a medium bowl.  Place over the heat and cook until the custard has thickened, do not over heat.  Remove from the heat and cool.  Place the fruit in a liquidiser and puree lightly but do not overdo so that the fruit is a pure liquid, it should still have a bit of texture.  When the custard is cool stir in the yogurt and half of the pureed fruit.  Using 4 glass dishes (or glasses) place a layer of the fruit custard in the bottom, then swirl nearly half of the remaining fruit.  Add another layer of the custard then the rest of the fruit leaving about a little to finish. 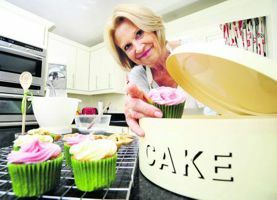  Beat the 200mls of cream until thick and pipe or place swirls on top of the top fruit layer. 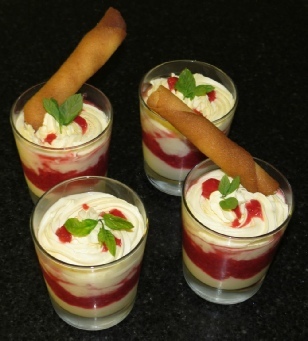  Finish by dribbling a little fruit puree on the top, a sprig of mint and a short bread biscuit or wafer.